In return for allowing you access to http://www.chihuahuaproducts.com, we require you to accept the terms and conditions of use set out in this notice. If you are not prepared to agree to these terms then you must immediately leave this website and you may not use or access our services. You can e-mail any changes in your details to us at chihuahuaproducts@b2dog.com or online once logged in, via the my account section. Wrap your item(/s) safely and securely to avoid damage in transit back to http://www.chihuahuaproducts.com (please note http://www.chihuahuaproducts.com is unable to accept an item for refund if it has been damaged in transit). It is advisable to obtain a proof of posting certificate if using the Post Office and arrange the necessary compensatory cover for the items. Include returns information (including your name / address, reason for return & order number) and send your package back to Chihuahuaproducts.com, c/o Urban Trek, Wellington Park Business Centre, 3 Wellington Park, Malone Road, Belfast, Northern Ireland, United Kingdom, BT9 6DJ. We recommend returns by recorded or registered post. Please note that http://www.chihuahuaproducts.com will be unable to refund items returned to us which are lost in the post. It is advisable to obtain a proof of posting certificate if using the Post Office and arrange the necessary compensatory cover for the items. Be in breach of any copyright, trade mark, privacy, confidence, or any other third party right, or cause any inconvenience to http://www.chihuahuaproducts.com , its employees, servants, agents, software and other suppliers or any other third party (including, without limitation, creating or procuring software viruses, chain letters, unsolicited communications and 'spam'). In the event that you breach any of these conditions, you will indemnify and keep indemnified http://www.chihuahuaproducts.com , its parent, subsidiaries, associated companies, employees, servants, agents, professional advisors, suppliers and affiliates from time to time against all damages, losses, claims, costs, charges, awards, orders, judgments and other liabilities suffered or threatened as a result of a breach of these conditions. 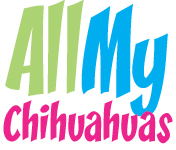 Trade marks may include (amongst others) the http://www.chihuahuaproducts.com name and logo. All content included on this website (including, without limitation, the trade marks of http://www.chihuahuaproducts.com , logos, graphics, text, photos, designs, logos, icons, images, data and software) is the property of http://www.chihuahuaproducts.com , its affiliates and licensors and as such is protected by international and UK copyright and other intellectual property laws.